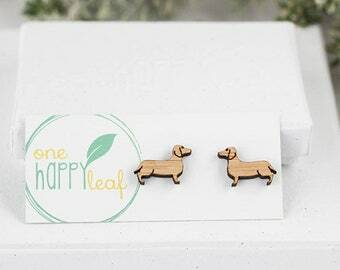 Eco friendly jewellery made of cute earrings, necklaces, hairpins, cufflinks, brooches and homewares! 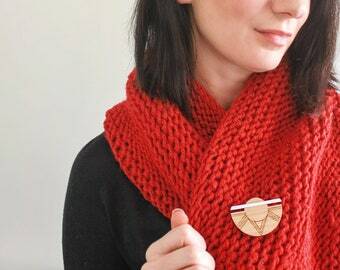 My eco jewellery designs are organic, inspired by the world around us using sustainable bamboo. I believe we can live well and look beautiful without harming the world. I believe that being eco-friendly doesn't mean being a bare-foot, non-showering hippie! Being eco-friendly can be sophisticated, styled and simple. I am an environmental scientist by education but started One Happy Leaf as I wanted to extend my passion for living sustainably and styled far beyond the sunny shores of Perth, Australia. It’s currently raining outside yet I am making jewellery to prepare for the Christmas market season! What’s with this weather #perth? Happy days! Wearing this necklace out to lunch today. We love making wedding days a special day. New wedding name tags made and shipped out! I am Anna Anagno and I design and make jewellery to inspire style with sustainability. In 2013 I saw an opportunity to incorporate eco-friendly principles into style after I was frustrated by the lack of environmentally conscious options in fashion accessories. I originally studied Environmental Biology so I was passionate about preserving the environment. I also wanted to debunk the myth that eco-friendly fashion couldn’t be modern, contemporary or stylish. My mission for One Happy Leaf is to use it as a vehicle to create global change. 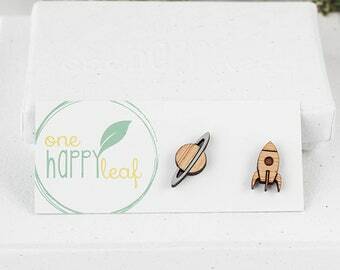 For every order, I will plant a tree on your behalf through Trees for the Future. I have an audacious goal, to plant 1 million trees by 2023! But my story started long before the Feature Seller Blog. At the end of 2014 (after 10 years working in the field of environmental health legislation) I quit my day job to work full-time on my business designing and making jewellery. I found a new passion in creating beautiful, simplistic jewellery that is designed for women who want seasonless style with substance. My background in environmental studies has heavily influenced many aspects of my business. 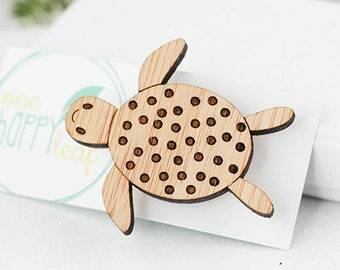 My designs are organic, inspired by the world around us and are laser cut from quality bamboo. 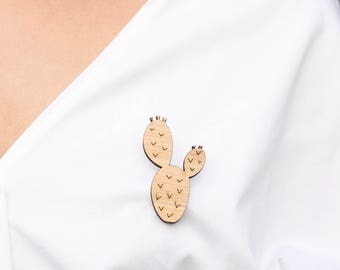 The bamboo used in One Happy Leaf is a particular species that pandas do not eat, so you can rest assured that no pandas will go hungry in the making of you jewellery! After the designs are laser cut, each and every jewellery piece is assembled by me, in my little studio in Perth, Australia. I share my studio space with a snoring 16 year old cat. To me, selling jewellery on Etsy isn't just about the 'selling'. It's about inspiring followers to make environmentally responsible purchases and to live a life that brings themselves and others happiness. And a job that allows me to give that joy to others, makes me happy too. 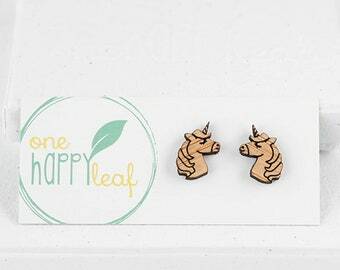 Anna is the powerhouse behind the One Happy Leaf store. Master of multi-tasking and list finisher extraordinaire! Between designing, making and packing her time is spent with a tea in hand while planning the next challenge. - Pinterest: Our store uses Pinterest Tag to track our customers' behavior. - third-party providers used by us will only collect, use and disclose your information to the extent necessary to allow them to perform the services they provide to us. Certain third-party service providers, such as payment gateways and other payment transaction processors, have their own privacy policies in respect to the information we are required to provide to them for your purchase-related transactions. For these providers, we recommend that you read their privacy policies so you can understand the manner in which your personal information will be handled by these providers. - Links -when you click on links on our store, they may direct you away from our site. We are not responsible for the privacy practices of other sites and encourage you to read their privacy statements. 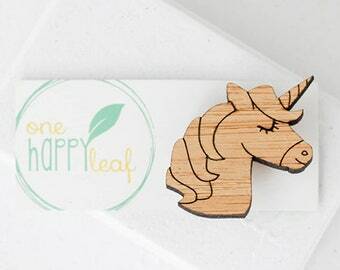 We also like to show you www.onehappyleaf.etsy.com adverts as you browse the web so you can see our latest products and deals. We will also send you service messages by text or e-mail so we can let you know when your order is coming. We may also send you information by e-mail or post to let you know about new products to keep you up to date. We only send this with your permission. We share your Personal Information with third parties to help us use your Personal Information, as described above. For example, we use Etsy to power our online store--you can read more about how Etsy uses your Personal Information here: https://www.etsy.com/au/legal/privacy/?ref=ftr. We also use Google Analytics to help us understand how our customers use the Site -- you can read more about how Google uses your Personal Information here: https://www.google.com/intl/en/policies/privacy/. You can also opt-out of Google Analytics here: https://tools.google.com/dlpage/gaoptout. 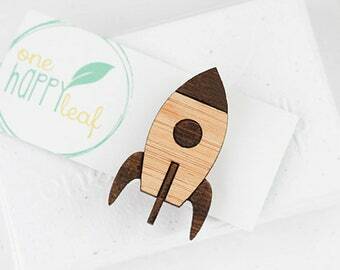 Please note that, as www.onehappyleaf.etsy.com comprises a complex web of many inter-connecting services, it might take a few days for all our systems to be updated, so you might get messages from us while we process your request. Additionally, if you are a European resident we note that we are processing your information in order to fulfill contracts we might have with you (for example if you make an order through the Site), or otherwise to pursue our legitimate business interests listed above. Additionally, please note that your information will be transferred outside of Europe, including Australia, Canada and the United States.